Our iconic Vickers Viking replica perches on what appears to be a rocky shore in the Northern wilderness. It is the first of many transformations as our new 'story islands' take the visitor back to the glory days of these historic aircraft. But we need your help to make the displays authentic. So we are putting out the call for items to give our scenes the look and feel of those long-ago days. We need 1900s-style storage sheds, late 1800s-era wooden barrels, early 1900s gasoline cans and tin containers and similar vintage cookware. We're also looking for authentic clothing from period such as bush-pilots' jackets, coats, pants and boots. "These are the sorts of things people would have on their farms or in their garages," says AAM Curator Lech Lebiedowski. "Quite often they don't know what to do with them. They don't want to throw them out because they have sentimental value. This will be ideal situation because these items will preserved and on display to the public." You can see examples of some of the items pictured below. The full list of what we seek is here. 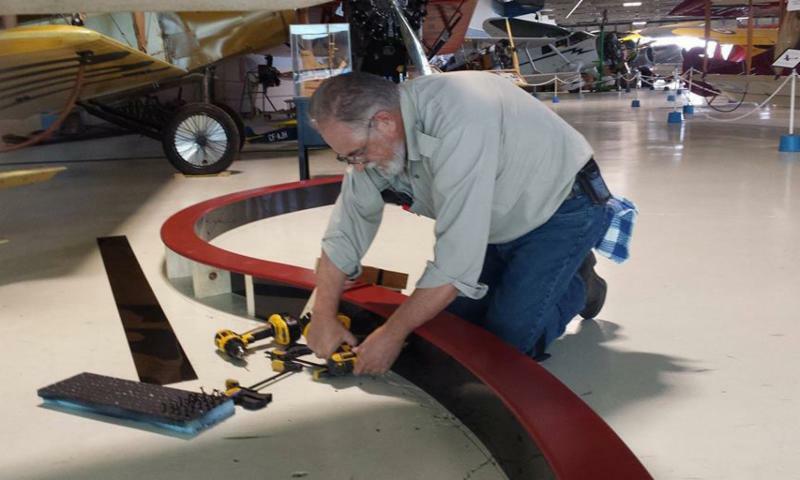 The museum is also looking for people to help assemble the exhibits. We need helpers available Tuesdays and Thursday during the day who are able to perform general labour duties. If you are interested, please call Erin at 780-451-1175 or email her at assistant@albertaaviationmuseum.com. This is a great opportunity to get your "hands dirty" and be involved in an exciting revitalization that will better tell the story of Blatchford Field's huge contribution to aviation in Canada. 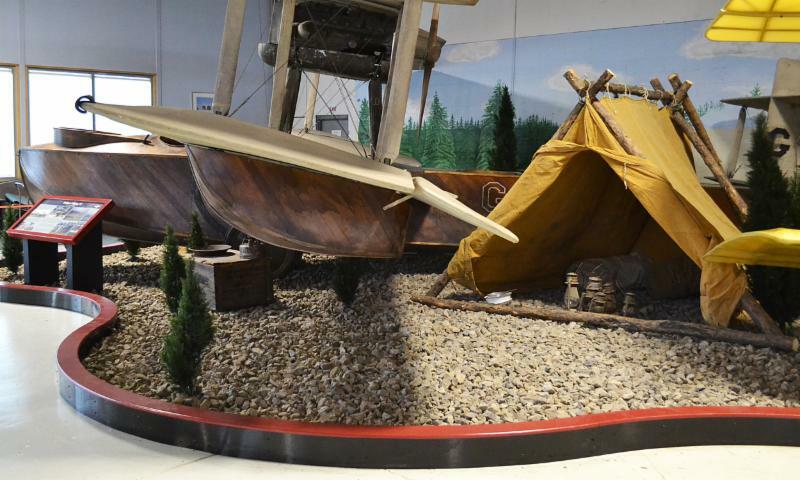 The Viking exhibit in progress depicting the amphibious bush plane on a wilderness beach. Some of the items we require to enhance our exhibits. See full list here. 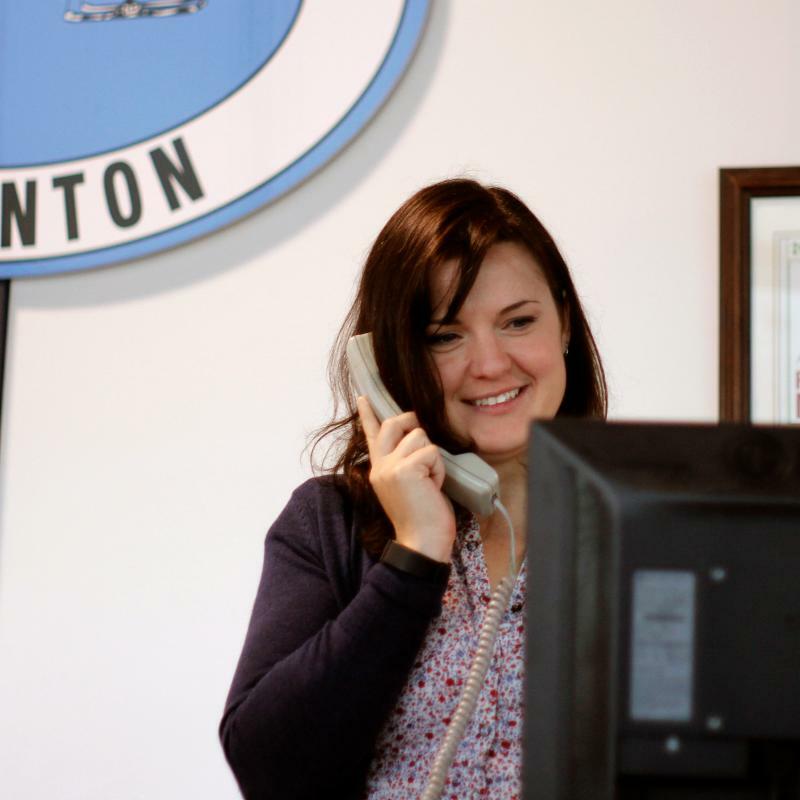 We are very pleased to add Ellie McKown to our staff as Visitor Services Coordinator. She has some impressive credentials in the museum field. "I studied history for about a decade," she says. "I was mid-way through my PhD when I realized I would much rather be doing public history, and that's really been my passion ever since." "You get a chance to actually see the impact of what you are doing rather than in academia where you are very isolated and maybe two people read what you write." Most recently McKown worked at Fort Edmonton Park where she still volunteers, as well as at John Walter Museum along with serving on the board of Friends of Rutherford House. She also has some family connections to Blatchford Field. Her mother's parents moved to Edmonton to work at the airport. As a child she says her father took the family to military museums all over Canada and the U.S.
McKown will be responsible for visitors, tours, memberships and the gift shop. She will also put her experience to work helping our Assistant Executive Director, Erin Hoar, with programming and other ways to attract new visitors through the doors. We welcome her to our team. 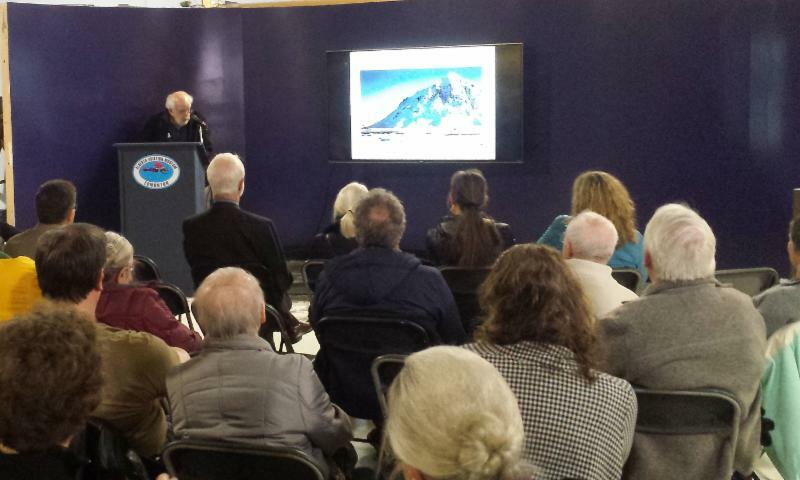 Henry Wyatt delivering the first in the museum's lecture series about his adventures in Antarctica in the 1950s. 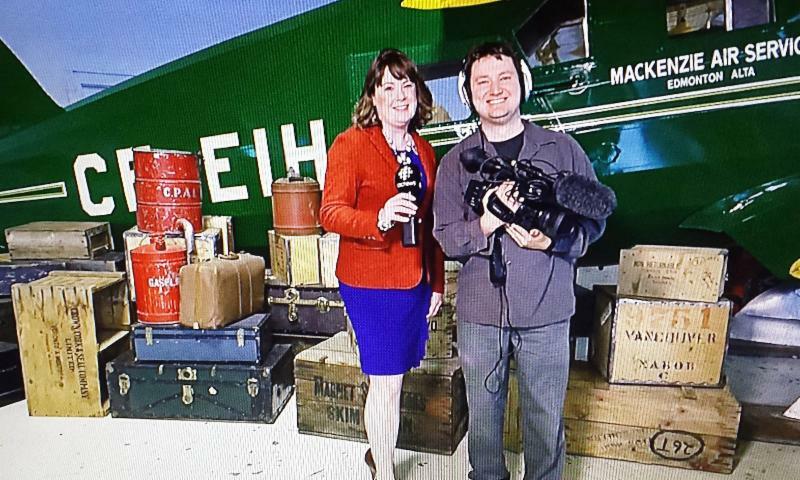 CBC TV's Our Edmonton host Adrienne Lamb and videographer John Roberts shooting an episode of their show which aired Thanksgiving weekend. 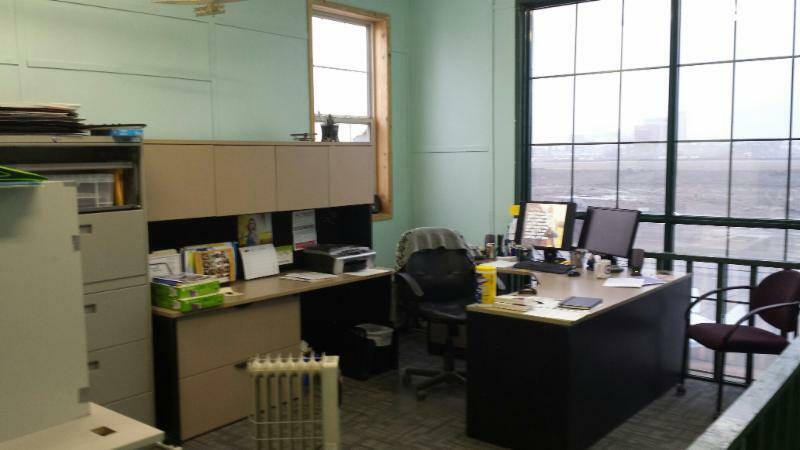 The new executive offices now occupying the old CASARA s pace on the second and third floor of the hangar. 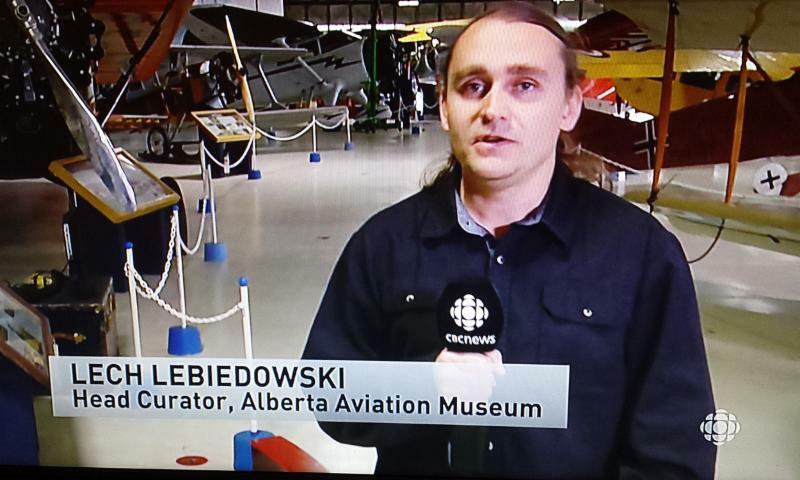 Curator Lech Lebiedowski talking about the museum's revitalization project on Our Edmonton. November 5, 1:30-3:30 pm. 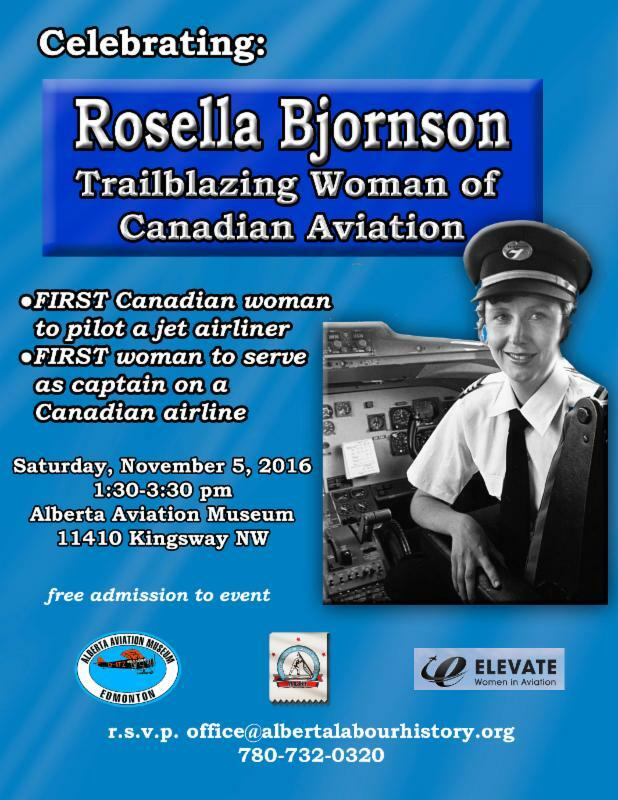 Celebrating Rosella Bjornson: Canada's first female airline pilot. Sponsored by the Alberta Labour History Institute, Elevate Aviation and the Alberta Aviation Museum. Join us as we honour a trailblazing woman of aviation. Free admission to the event. RSVP required. Contact www.albertalabourhistory.org or phone 780-732-0320. November 11, 10:30 am. Remembrance Day Ceremony at the Hangar. Sponsored by 700 (City of Edmonton) Wing RCAF Association, 418 Squadron Association, 504 Royal Canadian Air Cadets and Ex-RCAF Women's Association. Free admission to the ceremony. Admission to the museum by donation. November 17, 7 pm. Fighting 'The Beast' From the Air. 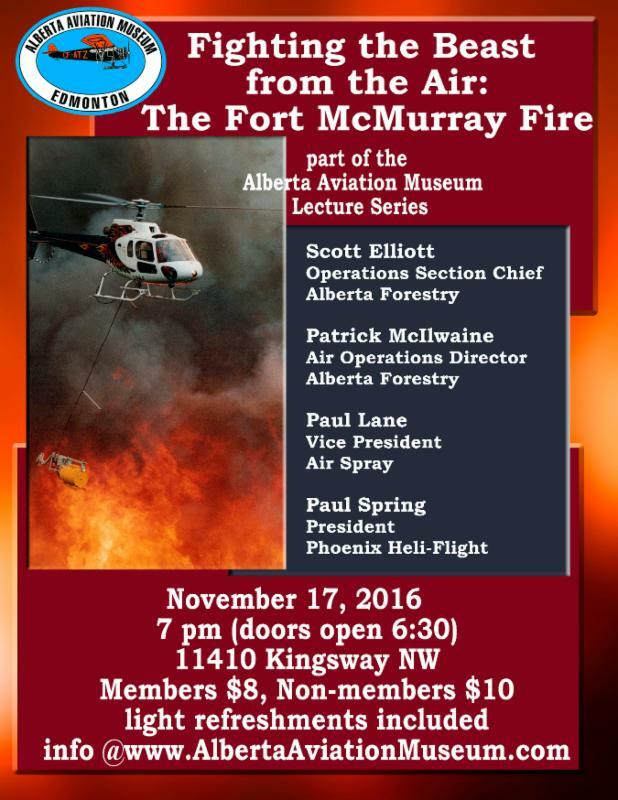 Our AAM lecture series continues with four speakers who were intimately involved in battling the wildfire in Fort McMurray. Scott Elliott and Patrick McIlwaine from Alberta Forestry, along with Paul Lane, Chief Pilot, Air Spray, and Paul Spring, President, Phoenix Heli-Flight, will discuss their involvement tackling the massive forest fire. Members $8, non-members $10. More details here.